Sit back now and let us tell you a tale. An amazing tale of French cabin boy Narcisse Pelletier who was shipwrecked, left to die, rescued and adopted by an Aboriginal clan and then ‘rescued’ again 17 years later. So wrote Captain Frazer of the John Bell in 1875, some 17 years after young Narcisse was abandoned by the captain of the Saint Paul on the eastern coast of Cape York Peninsula. Narcisse was only 14 when he joined the Saint Paul in Europe as a cabin boy and left for Bombay (now Mumbai) and then on to Hong Kong where they picked up more than 300 Chinese labourers heading to work in the goldfields of New South Wales. With rations running out, and fearful of mutiny, the captain made the fateful decision to opt for the quicker but more dangerous route to Sydney, sailing between the Solomon Islands and the Louisiade Archipelago. “Much as the crew dreaded the Chinese, they dreaded the savages more, and accordingly returned to the island which at first afforded them refuge. Once more in comparative security, their former fears returned, and they held a consultation as to what should be done, it being finally decided to embark in silence at dead of night, when all the Chinese should be asleep. Narcisse, overhearing what was said, followed the sailors down to the boat, and embarked with them in their new venture. The aftermath of the captain’s abandoning of the Chinese labourers is detailed in the report by Captain Frazer which is held in our collection. I have the honor to report that on the 5th instant Capt Frazer of the brig “John Paul” of Sydney, brought into Somerset a white man whom he found amongst the natives of the northeast coast at a spot opposite Night Isl about 13 miles NW of Cape Sidmouth. “I took charge of the man at once, though he had almost entirely forgotten his native tongue he had not forgotten how to write his name. He has since partially recovered sufficient recollection of his own language to be able to communicate the following particulars. His name is Narcisse Peltier [sic], a native of St Gile, a fishing village on the west coast of France. His father’s name was Martin Peltier [sic] and his mother’s Alfonsine. He had two younger brothers named Elie and Alfonse. He is one of the survivors of the French vessel St Paul from Bordeaux which was wrecked at Rossel Island, Louisiade Archipelago, in 1858, on her voyage from Hong Kong to Sydney with 327 Chinese passengers. He was a boy of 11 or 12 years of age at the time, and was one of six persons who, with the captain, left the wreck in a boat with the intention of making New Caledonia. They appear to have got down the coast at some point at a considerable distance, as Narcisse states, from the neighbourhood of where he was eventually found. He says the boat was short of water, and the Captain put into a bay on the coast for the purpose of obtaining water- that he (Narcisse) got out of the boat and laid down under a tree and fell asleep, and was left behind by the Captain – that for three days he was alone in the neighbourhood of a waterhole and existed on what fruits and berries he could find. That the first blacks who came him were 2 men and 3 women, who fed him with coconuts, and that they took him to the tribe after 6 days walking. He states that the name of the tribe is Macadama, and his name amongst them ‘Anco’, that they treated him very kindly always, but would not allow him to communicate with any vessels that were passing. He is marked with large scars over the abdomen and breast, and also on the right shoulder, besides having the septum of his nose pierced and the lobe of his right ear perforated and stretched downwards as if by a weight. “When discovered, Narcisse was stark naked, like the rest of the tribe, his body burnt by the sun to a rich red colour, and having a glazed appearance; his breast adorned with raised lines of flesh, of the thickness of a pencil, while the lobe of his right ear was ornamented with a piece of wood about half-an-inch in diameter and four inches long. 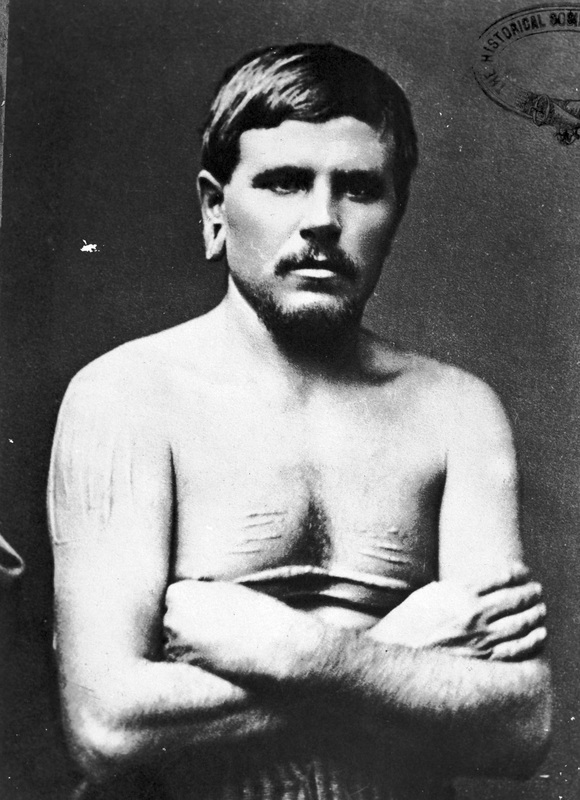 The cuts on his breast, of which he is very proud, were made with pieces of broken glass-bottles [..]. Narcisse however did return to France, arriving in his home town of Saint-Gilles on 2 January 1876. He was offered employment in a travelling show, but declined the offer when he discovered he was to be billed as the ‘huge Anglo-Australian Giant’. Instead Narcisse became a lighthouse keeper of the Phare de l’Aiguillon near Saint-Nazaire. In 1880 he married 22 year old seamstress, Louise Désirée Mabilou. His marriage certificate gives his occupation as ‘signalman.’ They lived near the entrance to the harbour of Saint-Nazaire where he worked, but had no children. Narcisse died on 28 September 1894, aged 50. Thank you for posting. So much history that we do not get to hear about.